February is our family's month to learn about service. So, to kick it off, I decided to get myself "psyched up to serve"
by making this sweet little ruffled apron. 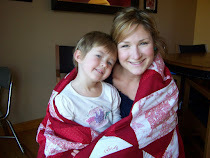 (It's also my first sewing project for the "Sewing Smack-down"
as our family goes through our own "Service Boot Camp". Start by creating a 1/4 inch hem all the way around piece A.
leaving one long side unhemmed. Gently pull the threads to gather and create your ruffle. Repeat for the other three B pieces. at about one inch from the bottom. Adjust the gathers to fit all the way across piece A.
Pin down and sew across to secure. making sure that the top ruffle overlaps the one beneath it by about one inch. leaving about 1 1/2 inches of piece A at the top. Next, hem around pieces C, leaving one short side open. Take piece D and create a 1/4" hem all the way around it by folding and ironing. Fold piece D length-wise over the top of your apron. Press. Insert pieces C into the sides. Sew, taking care to tuck all unsewn edges under. I love, love, love this apron. So does my daughter, who has asked me to make her a "tutu", too! since I plan on having my kids serving right along side of me. I will post the child apron pattern soon. see the tutorial on One more Moore for more details. ahhhhhh....you posted early. how fair is that? But it's a lovely fluffy apron. Good choice of fabrics, too. I can see who wants braggin' rights! love the colors and patterns of your apron. that's great your kids want one too. WOW! This is just awesome! I came by way of Dawn's blog. Hmmmm, am I a traitor if I vote for your project? Perhaps she won't notice??? Love this skirt, wish I could sew!! !